Hillary Clinton is at it again. At a recent conference in California, Hillary sat herself down in a red leather chair - apparently symbolic for a hot seat - and once again blamed Trump, the Russians, James Comey, and others for her loss in the presidential election in November 2016. Only this time was different, because she also blamed the Democratic Party and the Democratic National Committee for her defeat. She also complained that the party was bankrupt. Well, it's certainly intellectually bankrupt, but Hillary means it was financially bankrupt and "on the verge of insolvency" when she became the nominee, and she bitched that she had to throw money at the DNC's data collection system. 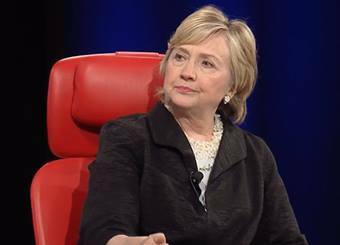 "Its data was mediocre to poor, nonexistent, wrong," Clinton explained. "I had to inject money into it." This comment left Democrats incredulous. While the party has had its money issues, party insiders said that the problem with data has been less of a cash-infusion issue or a quality issue than a chronic inability to make it uniform and consistent - something that Hillary apparently failed to grasp when she was the party's de facto leader as its presidential candidate. According to one Democratic insider, Hillary showed disregard for warning signs in key states like the so-called "blue firewall" of Pennsylvania, Michigan and Wisconsin, which all went to Trump. The DNC's voter data in those three states, he said, didn't look anywhere near safe but Hillary's campaign team "thought they knew better." 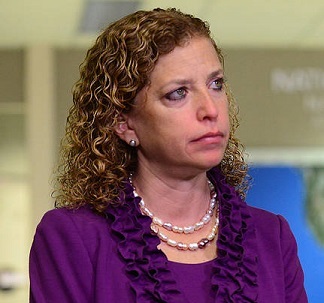 Her deflection of responsibility for her loss to people like Debbie Wasserman Schultz is more like mean, stunted fruit than sour grapes. Hillary has taken to acting like the 2016 presidential campaign isn't over. She needled Trump for his infamous "covfefe" typo on Twitter, and when Trump re-iterated her penchant for blaming everyone but herself for her loss, she then replied, "People in covfefe houses shouldn't throw covfefe." She's still campaigning and apparently won't leave the stage until she gets a rematch with Trump. Hillary - it's over! Stop it! You're not doing any favors for anyone! Except the Republicans, particularly Reince Priebus, Trump's chief of staff, who cheerily tweeted how you conceded that the Republican Party "has much better resources and data than [the Democrats]." You just didn't throw the Democrats under the bus, you threw them under a convoy! But then, getting thrown under a convoy of buses by the candidate she rigged the system for doesn't make Debbie Wasserman Schultz a martyr . . .
. . . it just proves that she's as incompetent as a political operative as she is as a member of Congress.